How do I Use My Store's CRM module? How Do I Set Up My Store's Gift Registry? What is the Store's Wishlist Feature, and How Does it Work? How does the 3dcart Affiliate program work? What Are My Customer Export Options? How Long Does The Affiliate Tracking Cookie Last? Can I add additional fields to my Customer Registration Form? Can I create checkout questions for specific Customer Groups? How do I import Customers via CSV? How Can I Manage My Customers? How do I set up wholesale pricing levels? How do I use my 3dcart Store's CRM module? Why does my exported CSV data get converted to weird formats? How can I adhere to GDPR requests on my 3dcart store? Can I Find Customer Records Without Orders? How do I use the GDPR Toolkit? 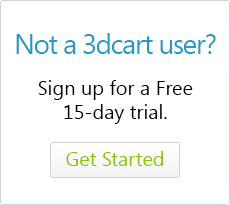 How do I Integrate my 3dcart Store with Freshdesk?